The Maine Township Emergency Food Pantry provides food on an emergency basis to persons living in the greater Maine Township area. To receive assistance on a continuing basis you must reside in Maine Township. The first Maine Township Food Pantry program began in 1981 when the Township gave out fifteen food baskets during the Christmas season. Today the Emergency Food Pantry supplies 150 boxes of food every month, which go towards feeding over 300 individuals. Each box is hand packed by township staff and volunteers with dozens of non-perishable food items to help supplement the needs of township residents in distress. The food is donated by individuals, businesses, and local organizations such as churches, schools, and Scout programs who hold food drives to keep the Food Pantry stocked throughout the year. 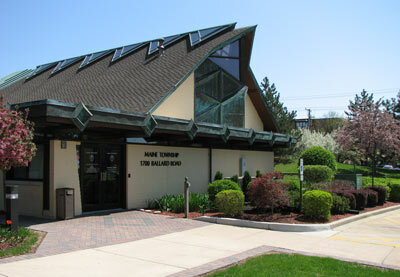 The Park Ridge Human Needs Task Force has been a regular contributor to the Food Pantry for many years. Monetary or food donations may be dropped off during normal business hours of 9-5 PM Monday through Friday at the Maine Township Town Hall, 1700 Ballard Rd., Park Ridge. You may also mail donations to that address. The food pantry is open for residents Tuesday and Friday from 1-4:30 PM. Founded in 1850, Maine Township is the oldest unit of local government in the area. Maine Township’s mission is to improve the quality of life for its residents by providing services, general assistance, information, and programs in a fiscally responsible manner. During its existence, it has seen its surroundings grow from a predominantly rural farming community to a major metropolitan area with some 130,000 residents. 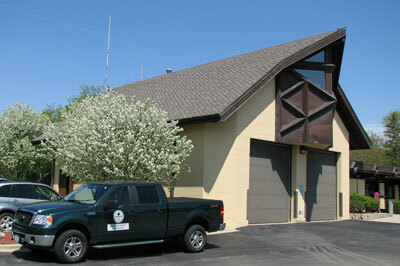 The Township moved to its current headquarters at 1700 Ballard Road in Park Ridge in 1983. The building was a former church designed by Lloyd Wright, son of the famous architect Frank Lloyd Wright. Maine Township’s Town Hall stands on land originally purchased as farmland by William and Bertha Pump in 1918. They later sold it to a real estate developer. In 1957, the site committee of Good Shepherd Community Church was searching for a permanent location for their parish. Godfrey Lindstrom, a home builder, heard about their search and agreed to set aside two and a half acres at the southwest corner of this new sixty-home subdivision, known as Ballard Gardens, in the unincorporated area north of Park Ridge, Illinois. Declining membership forced Good Shepherd Parish to sell its 20,000-square-foot church building to Maine Township in 1983. Prior to 1983, Township meetings were held in a rented storefront at 2510 Dempster Street in Des Plaines, near Maine East High School. Before the Township could occupy the building, it required $400,000 worth of improvements, including moving the main entrance to what was the rear of the building, and installing elevators. In the summer of 1995, construction began on an addition to the Town Hall to accommodate the need for more space in General Assistance, Disabled Services and other Township departments. This 7,000-square-foot addition, built for $1.1 million, was designed under the consultation of Dennis Stevens, an architect trained in the building’s original Wrightian style. 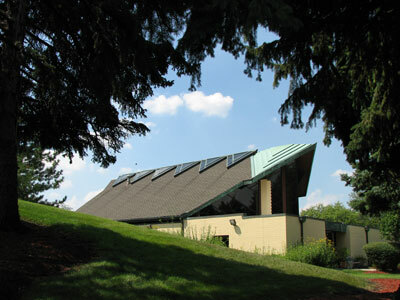 Work on the addition was completed in May 1996, and provided a double-car garage and additional office space to accommodate increased demand for Township services. The Maine Township Town Hall is brick masonry with a steeply sloped asphalt roof bordered with an eight-to-twelve-inch strip of copper, that patinated to a deep shade of green over the past 40-plus years. Its dramatically peaked front and rear roof holds a series of triangular, copper-trimmed skylights running east-to-west. The main meeting room ceiling is at least twenty feet high. The building’s 27,000 square feet contain the first floor, a fully finished basement and a second story office overlooking the main meeting room that served as the sanctuary for the original church. An outside berm, now located several feet from the south was originally adjoined the building, making the south wall a living wall, containing plants and a waterfall. The berm separated from the building by a sidewalk now contains a prairie garden showcasing flowers indigenous to original Illinois prairie. 1975 — The Township establishes MaineStay Youth Services to enhance the strengths of the family, prevent juvenile delinquency and help young people become responsible members of the community. 1983 — The Township hosts its first Agency Day, an annual event to encourage networking and cooperation among local social service agencies. 1985 — The Township creates a full-service senior services department, appoints a committee of seniors to help plan activities, and hires a full-time director for the program. 1987 — The Township establishes MaineTRAC (Maine Township Restitution for Adolescent Change), a restitution program for juvenile offenders ages 12 to 17. 1990 — The Township begins a police hireback program to ensure a Cook County Sheriff’s officer is in the unincorporated area at all times during scheduled patrol hours. 1992 — The Township and the North Suburban Council on Employment for Persons with Disabilities sponsor the first Job Fair for the Disabled. The Township also created the Youth Drop-In Center (now the TLC Teen Center) with the cooperation of volunteers in the Maine Township Task Force Against Gangs. 1994 — The Township establishes an in-Township taxi transportation service for disabled residents. The Township also begins offering recreation scholarship for local, low-income youths who wish to participate in day camp and after-school programs. 1995 — The Township receives a Governor’s Home Town Award recognizing the volunteers who helped create and operate the Youth Drop-In Center (now the TLC Teen Center). 1996 — The Township receives a Governor’s Home Town Award recognizing the volunteers who participate in Maine Township’s Neighborhood Watch. 2001 — The Township receives a Governor’s Home Town Award recognizing the Maine Township Food Pantry. 2015 — The Township establishes Recovery Connection to help young adults in recovery avoid returning to alcohol or drug use. 2016 — The Township begins to offer affordable psychiatric services in response to the closing of Maine Center. No paper applications are available. Please call General Assistance at 847-297-2510 x236 to schedule your appointment and obtain a list of documents needed. Special discounts are available for vehicle license plates and renewal stickers. To see if you qualify, please call 847-297-2510. Beginning in the fall of each year, our Energy Assistance Program (LIHEAP) can help low-income persons with a one-time credit toward their winter utility bills. Seniors and disabled individuals apply in October. Seniors, disabled individuals, and families with children under the age of 6 apply in November. Any resident can apply in December. Please call General Assistance at 847-297-2510 x236 to schedule your appointment. If you want help filling out forms to apply for Public Aid or Medicaid, one of our experienced staffers will be happy to assist you! Please call 847-297-2510 to schedule an appointment. Maine Township provides free assistance to persons who have problems or questions about their health insurance. Trained Senior Health Insurance Program (SHIP) representatives can answer questions on health insurance benefits and coverage, particularly Medicare, Medicare Supplements, and Long Term Care Insurance. To make an appointment with our SHIP representative call 847-297-2510. Do you have Rx insurance? Stop by Maine Township and pick up your FREE Coast2CoastRx Discount Prescription Card and receive a discount on your prescriptions. Anyone can use the card. It covers drugs not covered in health plans along with many pet prescriptions! Save money on health expenses that are not covered by insurance. Please call 847-297-2510 for more information. This program is for persons using prescription medications for specific ailments. Please call 847-297-2510 for more information. Senior and disabled citizens are an integral and vital part of the Maine Township community. We recognize that some members of our disabled and senior community may occasionally need assistance, and we are here to help. Maine Township has a Senior Disabled Advocate who acts as a clearing house for programs sponsored not only by the township, but also by the state, county, and local government. Any Maine Township resident who finds himself or herself in a difficult financial, medical or personal situation should visit our offices and speak to one of our trained staff to find out what kind of services may be available to accommodate their needs. This federal program provides discounted phone installation and monthly phone service. Please call 847-297-2510 for more information. Maine Township sponsors a subsidized taxicab program entitled MaineLines. It helps low-income people who are disabled pay for transportation in and around Maine Township. To see if you qualify for this program contact 847-297-2510. Maine Township recognizes that some members of our veterans community may occasionally need assistance, and we are here to help. General Assistance has trained staff that act as a clearinghouse for programs sponsored by the Veterans Administration and are knowledgeable about other agencies and programs that may benefit the veteran. We will try to assist any veteran who finds themselves in a difficult financial, medical, or personal situation, or any veteran who is frustrated with the forms and “red tape.” Contact our office and speak to one of our staff to find out what kind of services may be available. You may also want to explore the following resources to assist you in your employment search.